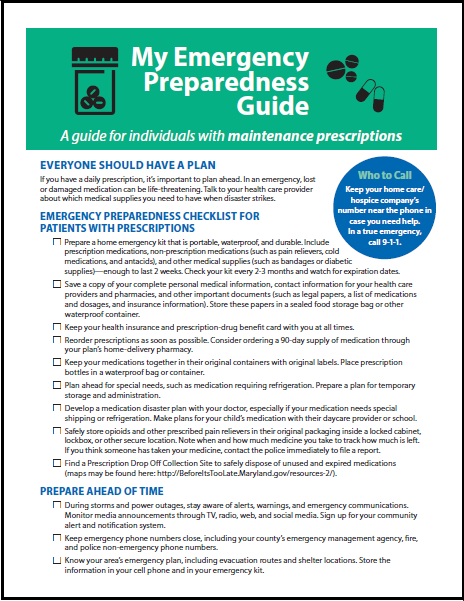 Use our My Emergency Preparedness Guides to prepare for specific emergency preparedness needs and My Medication List to have a handy reference of all medications. Homecare providers may download, copy, and distribute these free materials at will. have the supplies you need to stay healthy and safe in times of emergency. at least for a period of time, no matter where you are when disaster strikes. you won’t have access to everyday resources. As an individual with diabetes, emergency planning is important because you have to make sure you have the medical supplies you may need to stay healthy and safe in times of emergency. to have on hand that will last for two weeks. If you have a daily prescription, it’s important to plan ahead. In an emergency, lost or damaged medication can be life-threatening. Talk to your health care provider about which medical supplies you need to have when disaster strikes. As a person with kidney failure, or end stage renal disease (ESRD), planning ahead is critically important. During an emergency, being unable to receive dialysis treatment can be a life-threatening situation. Keep a copy of this list in your emergency kit and update it any time your prescribed medication, dosage, or frequency changes. Remember to take your medication list to doctor’s visits and the hospital. Complete a second page if you take more than seven medications.